Billy tackles a somewhat controversial topic in "Roberta," which is about a prostitute or call girl. The song is a ballad but the topic is not love; rather, it is about frustration. The protagonist cannot get what he wants as he states "I suppose that my small change won't see you through" and "I'd ask you over but I can't afford you." There are some lines that indicate the singer has feelings for Roberta such as "I know you're workin' but you must get lonely too, it's tough for me, ah, it's tough for you." Ultimately, however, the song begins and ends in frustration. The song is rarely, if ever, played live and is more or less forgotten. Billy did, however, discuss the song and play most of it at the New Yorker Festival in 2015 (see video, below right) at the request of some die-hard fans. He said that Roberta was a real person he knew while he lived in Los Angeles. Billy on "Roberta" from SiriusXM in 2016. 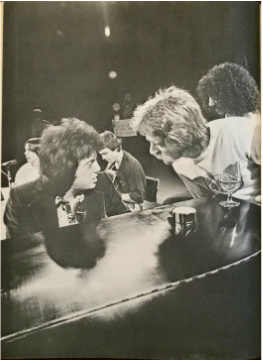 Billy Joel on Chip Monck's show "Speakeasy" in 1974. Photo from the Streetlife Serenade songbook. This is a photo of Billy on the Chip Monck program Speakeasy from 1974. Jackson Browne is on the left, Frank Zappa is on the right. Monck is at the piano with Billy. Listen (use player on left). Apparently a jam session broke out before taping of the program, read about it here (bottom of page). 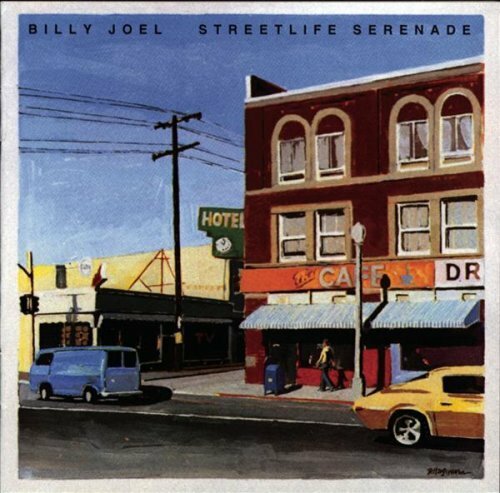 Audio only of "Roberta" from Streetlife Serenade. Billy discusses "Roberta" at the New Yorker Festival in October 2015.